Daytona Vacuum Elevator | OhGizmo! 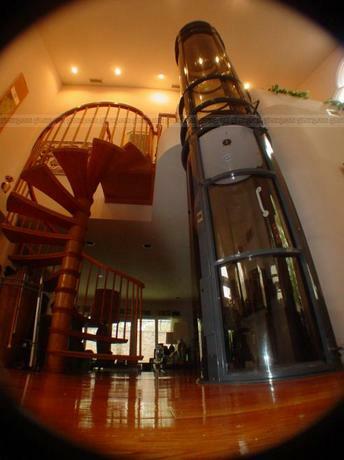 Bring the Jettson’s lifestyle to your home with your very own vacuum driven, Daytona Elevator tube system. Requiring only a 1 meter footprint (unlike conventional elevators that require a shaft and tons of hardware and such) the Daytona Elevator is self-supporting, constructed of aluminium and polycarbonate and takes just a few hours to install. Being able to fit into most 2 or 3 story homes, it is rated at a 450lbs lift capacity, so while it will move crippled old Grandpa, it won’t move your entire weight set upstairs. Also nice is that due to the laws of physics, you cannot freefall in this thing: the air just slowly lowers you if, say, the power were to go out, leaving you safe and trapped inside the transporter tube. After looking around I found out that this thing is a noisy beast, coming in at 87 decibels when operating. That is as loud as a coffee grinder or a tractor. While no price is available, you have to schedule a meeting for a quote. The rubber gaskets for the thing cost $200 a pop, so we’re talking serious cash here. Based on their site, I think the noise is pretty much confined to the pump assembly, which can be place in an attic or machine room up to 30′ away from the elevator.